As of mid-2016 the DJI Phantom 4 is the flagship product in the “consumer level” quadcopters made by DJI, the largest manufacturer of multirotors in the world. We purchased ours direct from DJI along with an extra battery. They are also available through Amazon, BestBuy and various local and online dealers. Following our own advice, we waited 90+ days after the initial release to purchase. This waiting period allows for the makers to update various parts of the system (usually software called “firmware”). 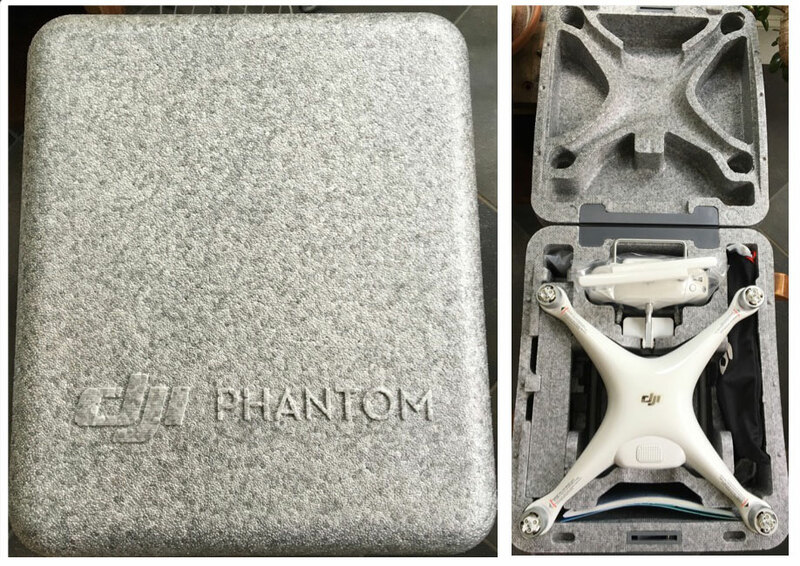 The Phantom 4 is packaged well and rough transit (shipping) should not harm it. An integrated two piece foam assembly – which serves as an everyday storage and carrying case – is included. This is a nice touch as the buyer does not have to immediately purchase an additional case. Those who do a lot of travel or hiking, may want to consider one of the many backpacks, soft or hard cases available. 1. The Phantom 4 body with battery and SD card. 2. The Remote (R/C TX) which appears almost identical to the Phantom 3 Pro and Inspire remotes. The Remote features a mount which holds your choice of smartphone or tablet – which powers the DJI Go software app. 3. Battery charger with connections for the battery and for the remote. 5. Basic documentation – which contains links to more detailed videos and manual. I was pleased with the simplicity of the packaging and setup – it can be offputting to see countless small plastic bags of various tools, adapters and accessories when unpacking some drones…not so with the Phantom 4. From my former experience, I knew that the first order of business was to charge up the batteries. This takes approx. an hour and provides a good break for the new owner to glance over the documentation, install the propellers. Note: The battery charger gets quite hot (140 F at one point) while charging. In addition, LiPo batteries should only be charged on non-combustible surfaces and while you are present. There are links to metal ammo boxes as well as fireproof “lipo bags” at http://www.phantominfo.com. A small terra-cotta planter pot can also serve this purpose well. Next, install the DJI Go app (IOS or Android). If you already fly or use another modern DJI Product (Phantom 3, Osmo, Inspire), the same app will work with the Phantom 4 – no need to reinstall (although you should update it if your version is older). The battery design and connection has been changed from earlier models – the connection to the drone is now in the rear of the battery (and rear of the P4 battery bay). Take care to install the battery correctly as it is possible to install it without it being properly seated. To accomplish this, press down hard on both the top and bottom flexible battery tabs while inserting the battery. Release them when battery is fully seated – then make certain that there is no visible gap where the top of the battery meets the Phantom shell. Installation of the propellers has also changed from earlier models. The new system uses spring-loaded locking cams – props are pushed on and turned approx. 1/8 of a revolution to lock into place. Propellers are color-coded – a black striped (around the hub) prop will go onto the two motors with black dots on the mounting area – while the silver/white propellers will go onto the white mounts. Note – the props are packed with clear plastic over the hub areas – be sure to remove this completely as it is possible that it could interfere with proper locking of the propeller hub mechanisms. 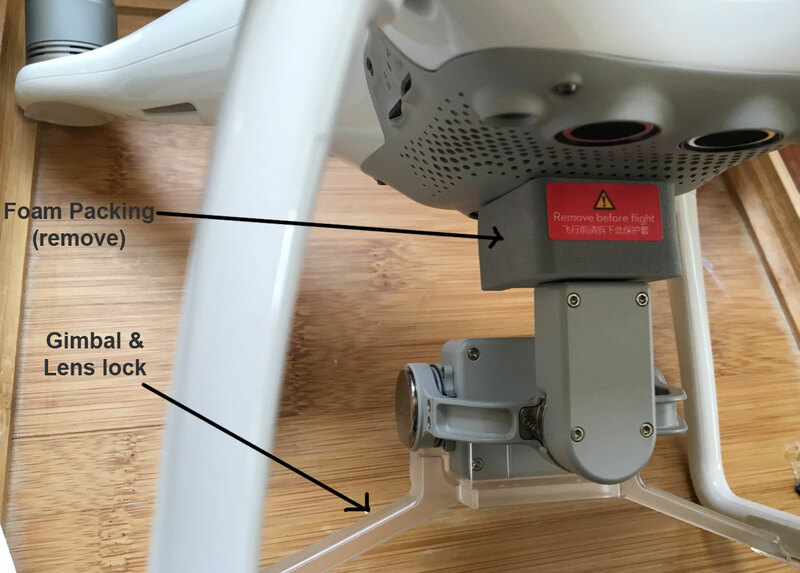 Be sure to remove the small foam gimbal packing piece as well as the gimbal holder/lens cap before powering up your Phantom 4. Gimbal lock and foam packing – remove both before powering up! Modern Camera Drones are built to a price and specification to fit a particular market. DJI has always been very aggressive both on pricing and on “bleeding edge” technology. The Phantom 4, sold at a high price than earlier models, allowed DJI more freedom in terms of using improved materials and adding features. Think of the Phantom 4 as a “nearly perfected” Phantom 3 – but with a couple extras that are new. 1. The Obstacle Avoidance System is new – these are forward facing cameras which use computer vision technology from Movidius, a company which has spent many years working on sophisticated hardware and software for this purpose. 2. Dual Compass and IMU – having two of each of these devices makes the unit, at least in theory, more reliable than the Phantom 3 series. 3. A more powerful propulsion system and battery – for a slightly better flight time as well as better wind resistance and higher possible speeds. 4. New improved materials and construction techniques – much of the gimbal hardware has been lifted up into the body in a magnesium structure – this helps the camera be more stable than that of the Phantom 3. 5. Improved Lens on the Camera – for sharper pictures and less barrel distortion. Some Phantom buyers may not care about these improvements or the better level of detail in the Phantom 4. In some ways it’s akin to a Lexus compared to a Toyota – Toyota makes both brands but the higher price of the Lexus allows them to refine many of the features. Overall, we are impressed with the fit and finish of the product as well as the engineering of the entire system. Once the battery is charged, insert it tightly into the Phantom. Mount your phone or tablet onto the Remove and connect with the proper USB cable (IOS lightning or Android usb). Power on the Remote and the Aircraft – and launch the DJI Go App. The App should then guide you through registration and a series of basic questions such as “do you want the Phantom to start in beginner mode?”. It may also prompt you to upgrade the Phantom firmware – although doing so is usually optional. 1. Follow the prompts on your device – this will entail the downloading of the firmware package to the device – and then the connection of your device directly to the USB port on the (powered-up) Phantom 4 (using an included adapter). 2. Download and installation of the DJI Assistant software package (PC/Mac) from the DJI support page and connection from a USB port on your computer directly to the Phantom 4. Most firmware updates are successful – however, it is possible to run into various problems. Most can be solved with patience and experimentation. For example, we ran into a problem where the DJI Phantom 4 was misbehaving on our first flight – and therefore tried to reinstall the firmware. Our efforts failed – both from the device and from the Assistant (Mac). 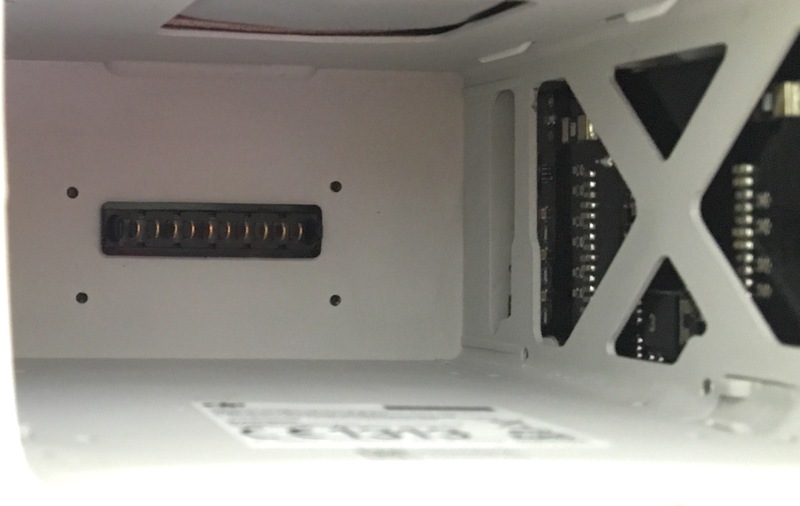 The problem was solved by the installation of a new MicroSD card – perhaps the stock card was corrupted or otherwise defective. Despite the advances in Drone technology these are still very complex devices and require some basic technical troubleshooting skills when things go wrong. If you are having setup problems with your Phantom 4, our suggestion is to replace the MicroSD card and the USB cables as a first step. Those less technically savvy might want to consider buying from a dealer who will agree (maybe for extra $$) to set up, test and fly your new Phantom 4 before delivery. In summary, the DJI software has improved greatly over the years – however, the entire system is quite complex and, when things go wrong, can be difficult for the uninitiated to set up or fix. Most problems can be solved by those willing to go online and read various forums and suggestions from other users. However, the impatient may find themselves challenged. It may help to keep in mind that these technical issues will make you a better operator and educate you into some of the workings of this complex aerial robot. Before taking to the sky, I did an IMU and gimbal calibration. The IMU calibration is done by placing the Phantom on a flat and level surface (granite countertop, etc.) and then navigating in the DJI Go App to: MC –>Sensors–>IMU Calibration. The gimbal calibration button is under the camera icon. Optionally, you can calibrate the Obstacle Avoidance System – these are the 4 cameras (two on top and two on the bottom) which help the Phantom 4 see and avoid obstacles and also to track targets (people, vehicles, etc.) in the “follow me” modes. This calibration can only be done on a Mac or PC using the DJI Assistant program. The program will walk you through the steps required – which includes holding the drone facing the computer and aligning with certain targets and scales shown on screen. A compass calibration should be performed outdoors in an open area away from all metal and other electronics. The Go app will walk you through this calibration. If done correctly, all of the calibration should hold for many flights – that is, no need to repeat them unless you experience problems or a crash, etc. First flights are best done in large open areas. Avoid the temptation to go out on your deck or small yard and take off. Depending on your device type, you may want to cache the local maps – if you are using a cell connected device (phone or cell connected tablet) there is no need to do this as the maps can download at the field. If you are new to this type of Drone, use the Beginner mode option which will limit the distance and height the Phantom will fly. If you have previous DJI experience, check ALL the settings in the DJI Go App and make certain they are set as you desire. Important settings include the RTH (Return to Home) behavior and altitude as well as the battery levels when warnings and automatic RTH will occur. The vast number of settings and options in the GO App are beyond the scope of this article. However, make certain your read the manual and spend as much time as possible learning about the various menus. Here is a link to many of the GO App menus for the Phantom 3 – the Phantom 4 is very similar other than the addition of the Obstacle Avoidance section. There is a full featured flight simulator built into the DJI Assistant program as well as the DJI Go App. Time spent with the simulator will probably help if you’ve never flown a Phantom. Our initial flight went well – all systems seemed to be working well and the Phantom hovered steadily and responded instantly to stick commands. The VPS (bottom facing sonar) and other instruments on-board seemed to be accurate. 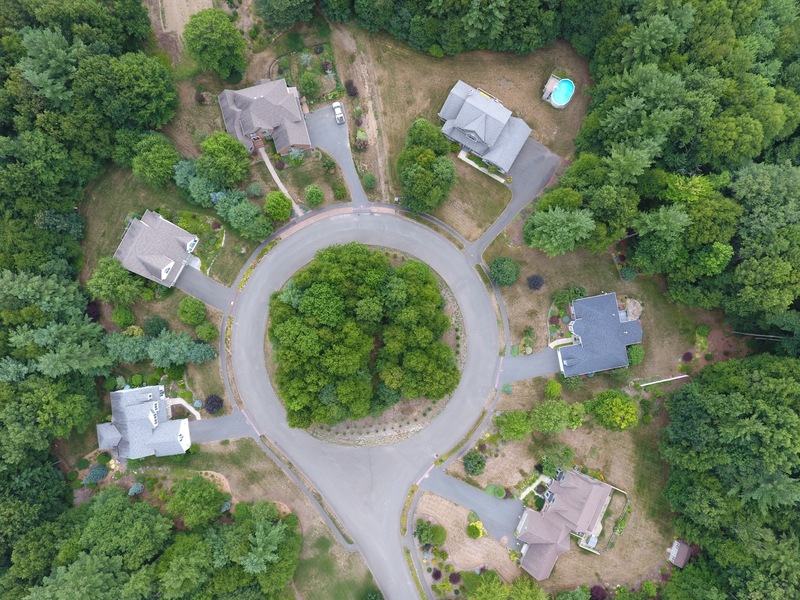 After a few minutes of flight, I few up to about 300 feet and took a couple sample pictures – here is one from high above the cul-de-sac. 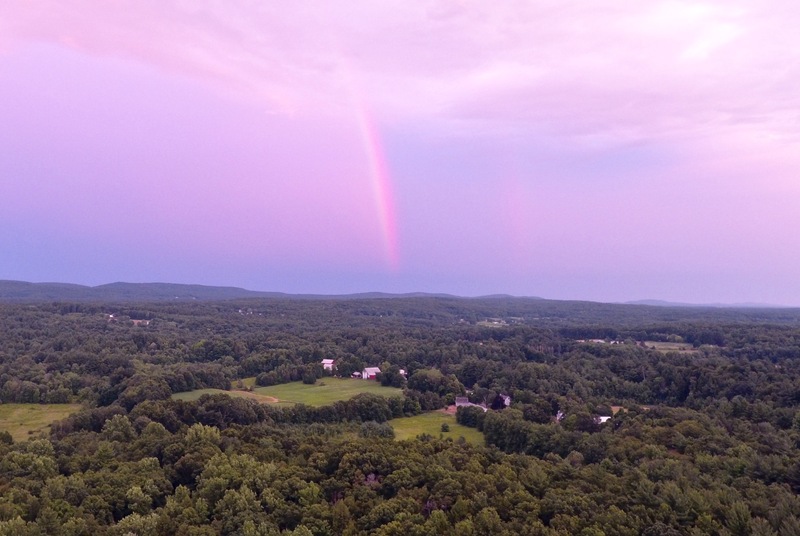 Later in the day I flew for another hour and, near dusk was lucky enough to capture a Rainbow – perhaps the Heavens were smiling on my new camera in the sky! Part 2 at this link focuses on the improved Camera and Gimbal and also feature some sample videos and pictures taken with the DJI Phantom 4. Thanks for reading! Part 3 is at this link – contains info on the Computer Vision and more! What is this FPV stuff all about? The Best of the Rest: Which DJI Alternative Should You Consider?